The 2014 season is looking great! Recent pruning work in the truffiére has found a significant number of newly producing trees. Some have had long existing brulé yet no truffles until now. 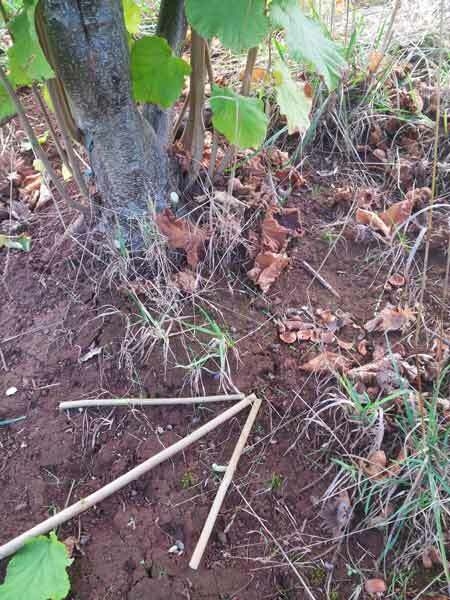 These have already revealed themselves, although current focus is on pruning, yet to come is the tending of the ground around the trees which typically discloses many truffles to an experienced eye. Assisting this effort has been the delightful company of our truffle dog trainee, Lani. She is an Italian dog breed, Lagotto Romagnolo, which roughly translates as a “Lake dog from the Romagna region”, where they were traditionally used as water retrievers, and more recently as truffle dogs. She is a highly energetic dog, on the go (hunting) all day long and not dissuaded in the least by wet weather. Hopefully we can redirect this drive into finding truffles, with the willingness to work in wet weather definitely being beneficial to our July/August harvest season. Current training sees her already walking without a lead out front by several metres, returning to heel at command. This will be quite useful in avoiding lead entanglements in trees. Next will be some scent location on command exercises.